It was late on July 1, 2004 and a thunderstorm was threatening Manhattan. This was causing lots of frowns and lots of worry. 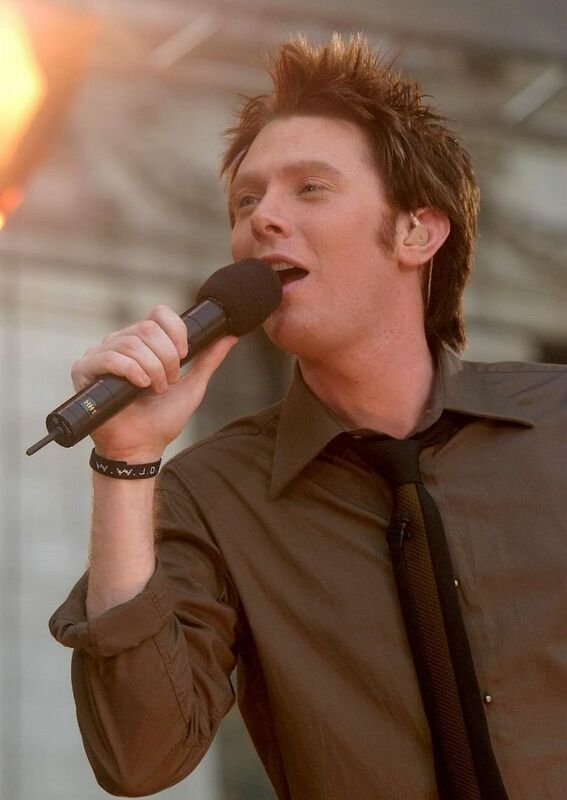 Bad weather just couldn’t happen…..Not at that time…..Clay Aiken was scheduled to perform early the next morning and some of the potential audience was already waiting OUTSIDE to see their favorite singer. 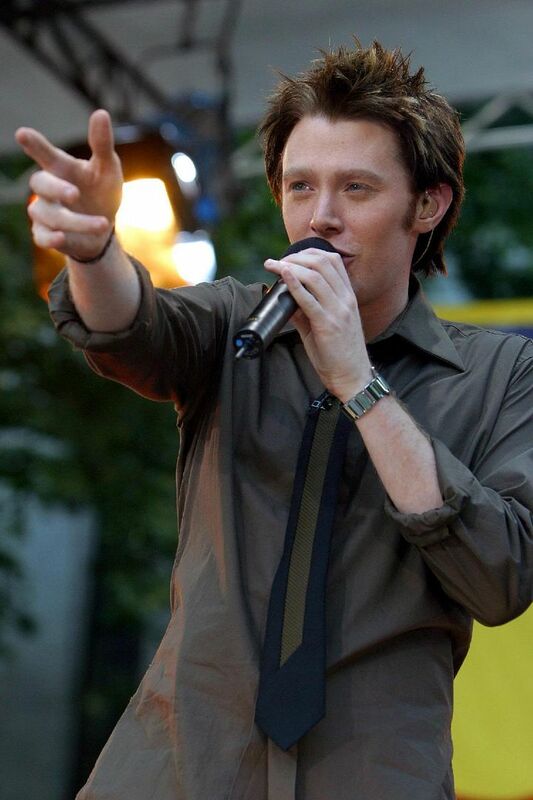 Clay Aiken was performing in Bryant Park for Good Morning America’s Summer Concert Series and fortunately, the weather was fine!! The anchors and reporters for GMA were amazed. 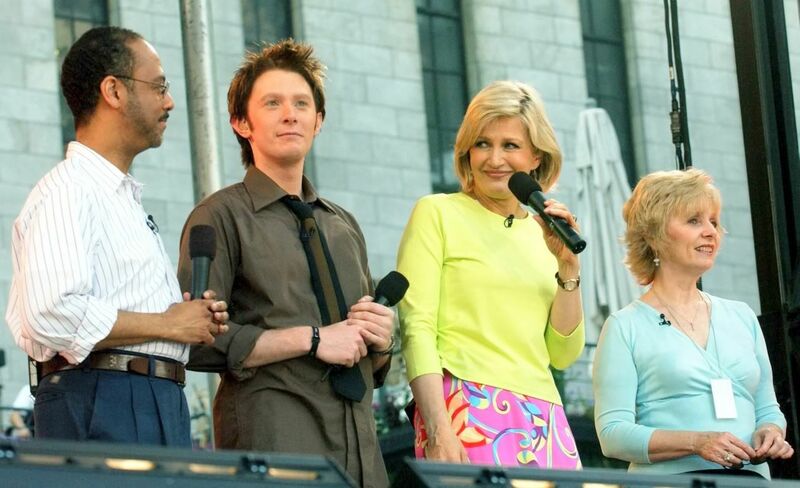 Each one, including Diane Sawyer, announced that it was the biggest fan gathering they had ever had for one of their concerts. The crowd was enthusiastic and there were many fans that brought signs declaring their love of Clay!! Clay’s mother, Faye Parker was at the park for the concert. She was excited about the concert and the fans and graciously signed many autographs for the fans. Before the concert started, there were many mentions of Clay and the up-coming concert. The weatherman for the show was stationed at the park. He interviewed audience members and was enthusiastic about the concert and amazed at the fans that had traveled from throughout the United States and Canada to see and hear Clay. Back in the station, the TV audience was told that Clay’s first album, Measure of A Man, had gone triple platinum. The audience also saw a clip of the cute skit that was a part of Clay’s visit to the Jimmy Kimmel Show. Clay, along with his band and back-up singers performed three songs. They “rocked out” on Invisible, I Will Carry You, and I Survived You. 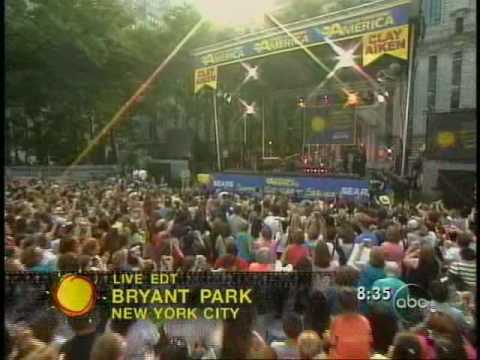 This performance was a warm-up for Clay’s solo tour that was scheduled to start later in the month. It was an exciting morning and everything seemed to go well. Clay looked great, the music was wonderful and the staff of GMA was supportive and shocked by both Clay’s wonderful concert, and the huge, supportive audience. AND, the thunderstorm didn’t hit Manhattan after all!! Relive this amazing concert by watching the great videos below. Summer + Great Music = Fabulous Memories!! What a way to start my Sunday morning with a great article and listening to the concert! Aww thanks for posting about the very thing that brought me into the fandom. RL had gotten in the way of me following Clay right after AI2. Thought I would see if there was anything on you tube of his one day and the GMA Suspicious Minds video was the first to pop up in a search. I was immediately hooked. OMG! Those crowds are not to be believed! I watched the show from home. I’ll bet OMC was always amazed at the crowds that showed up. Great blast from the past. Thanks for the pix and videos. ❤️ UNCONDITIONAL love for you Clay. God bless America. I was there, in the first row!!!! What great memories of my first road trip to see Clay!! Thanks for helping me relive this today! OMG, that brought back such great memories. Sleeping on the streets of NYC, the heat- all so worth it!! All I want is for my Son John To have Prayers said for him before he has his surgery on Aug8th .John loves Clay and is a special needs child, we lost our Son Brian also a special needs child on Aug 4th 2015. When John Found out the date he was going into the he said Mom thats 4 days after Brian died and then he said but I know Brian will be with me right Mom and told him yes he will he is always with us He is forever in our hearts. Error: Error validating access token: Session has expired on Tuesday, 21-Aug-18 16:13:01 PDT. The current time is Thursday, 18-Apr-19 21:47:31 PDT.